Among the more than 50 international delegates who attended the May 12 international seminar titled “Ho Chi Minh’s heritage in the current era,” many has expressed profound sentiments, recalling the late leader’s unforgettable memories legacy. After entering the Oriental Language Department of Beijing University in 1956, Mr. Yang chose Vietnamese language as his major. “Many people asked why I took on the subject I simply replied that I hoped that I would meet President Ho Chi Minh some day,” he said. His dream came when he was studying at Hanoi University and met President Ho Chi Minh, who visited the school in 1963. ”Until now a sense of happiness remains in me when I saw him for the first time in my life,” he said. In 1990, he recalled being the sole Chinese delegate at an international seminar commemorating the 100th birthday of President Ho Chi Minh. After completing his presentation, General Vo Nguyen Giap embraced him intimately. ”One year later, at an international seminar on Ho Chi Minh’s thought, held in India, I met General Giap again, who told me that some unpleasing incidents occurred between Vietnam and China, but that those incidents were just like black clouds that would drift away in the wind, allowing blue skies to reemerge,” he said. Over the past 20 years, Prof. Yang has dedicated himself to the promotion of cooperation in the academic domain between Vietnam and China. In 2005, Prime Minister Phan Van Khai invited Yang to the seventh National Congress of Patriotic Emulation. “The great image of Ho Chi Minh, his great thought, and his legacy to humankind will be remembered forever by the world,” he said. Russian delegate Dr. E. V. Kobelev, Vice President of the Russia-Vietnam Friendship Association, who can speak Vietnamese fluently, was a student at Hanoi University in the 1950’s and a reporter who covered Vietnam for the Soviet Union news agency TASS in the 1960’s. “I once lived in Vietnam for five years during which I had many opportunities to see and listen to President Ho Chi Minh,” he said. In spring of 1959, he met President Ho Chi Minh for the first time in Hanoi while he joined Hanoi students in planting a tree at Bay Mau Lake. “The President greeted us happily and joined in the planting,” Kobelev recalled. “Since then, every time I have a chance to visit Hanoi, I return to the lake and contemplate the trees we planted with the President in the old days,” he confided. He wrote a book on late President Ho Chi Minh: “Comrade Ho Chi Minh,” in tribute to his fond memories of the late leader. 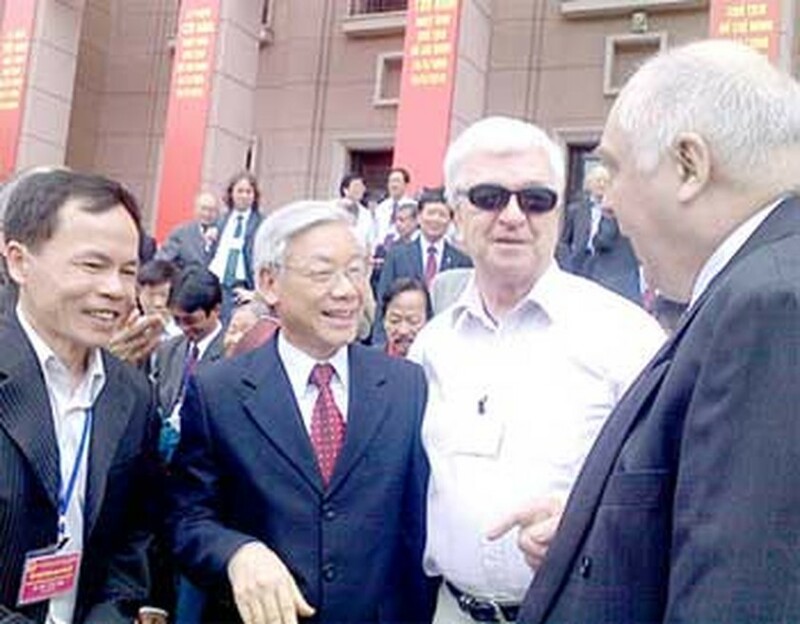 Kobelev said one of the most memorable moments in his life occurred when he served as a translator for the Vietnamese delegation, at the 22nd Congress of the Communist Party of the Soviet Union in 1961. “President Ho Chi Minh praised each of us for our Vietnamese fluency at the congress,” he remembered. “That guy speaking Vietnamese with a Hanoi accent is quite good in interpretation,” Kobelev recalled Ho Chi Minh’s comments on his Vietnamese specifically. He said he would remember forever the voice of President Ho Chi Minh urging his Vietnamese compatriots to maintain their determination in defeating the American invaders, from speech broadcast on the Hanoi radio station, July 17, 1966. The President’s speech came amidst American bombing raids on the capital city that day, he recalled. Kobelev also said he and many people of his generation still remembered the day when Ho Chi Minh visited the Soviet Union for the first time in 1955, as president of the Democratic Republic of Vietnam. “He was a great, sincere friend of the Soviet Union but he was also a man of simplicity and modesty. His image has remained unforgotten by the Russian people, even now,” he concluded. With a strong desire to help physically disabled children to live in harmony in the community and freely express their thoughts through arts, Mr. Phan Minh Thong, a deaf mute teacher in the Binh Thanh School of Hope for Hearing-impaired People (sited in Binh Thanh District of Ho Chi Minh City), is striving to teach them necessary drawing skills. Sharing the same background with his students, Mr. Thong has achieved impressive success.